Many academics, journalists, and politicians contend that Fidel Castro’s regime improved the conditions of the Cuban people. Here I challenge that claim by comparing its performance to those of two other dictators, Francisco Franco and Augusto Pinochet, regarding economic growth, literacy, life expectancy, democide and transition. Democide is a term coined by Professor Rummel to include deaths attributed to the government on account of killings, mass deportations, forced labor camps, etc. Transition refers to what followed the autocrat’s death or retirement—succession within the dictatorship or democratization. Taking up income first, according to the Maddison’s Project Daba Base (2018), between 1945 and 1975 (the last year of the dictatorship, Franco having died that year) Spanish real per capita GDP grew at an annual compound rate of 4.7%, more than four times the rate in the pre-Civil War period (1900-35). In Chile, in the three years of Salvador Allende’s Unidad Popular government the economy actually shrank by 3.5%, but during Pinochet’s regime (1973-90) the economy’s ups and downs yielded a net growth of 1.5% per year, about half a percent better than in the seven decades before Pinochet. (It is only in the last three decades that Chile has experienced steady growth of 3.4% per year.) As for Castro’s dictatorship, between 1959 and 2007, GDP per capita rose a mere fifth of one percent, less than half that of the entire pre-Castro era, which was low enough to begin with, and well below that obtained during Cuba’s democratic period (1940-52), when it grew by 2.5% per year. Actually, on account of the Castro regime’s idiosyncratic way of measuring economic output, the dual exchange rate, and the lack of transparency in the calculations (Pérez-López 2018) all official figures are suspect. Cuba’s GDP estimate, during and after the Soviet period, may very well be overstated, and could the more recent data may be as low as half or even less than what the government claims (Alejandro 2018). Turning to social welfare, by 1950 Spaniards already were on average living longer than Cubans or Chileans. This is shown in Figure 1, which also includes South America as a benchmark. Before Pinochet, life expectancy in Chile was 7 years lower than Cuba’s (64 vs. 71), but by the end of his reign the rates were identical (79). Now observe the parallels and contrasts in the plots. Those of Spain and South America rose in tandem in close to a straight line during the entire period. By contrast, Cuba and Chile parallel them only in the most recent two decades. Before that they diverged, but in different ways. 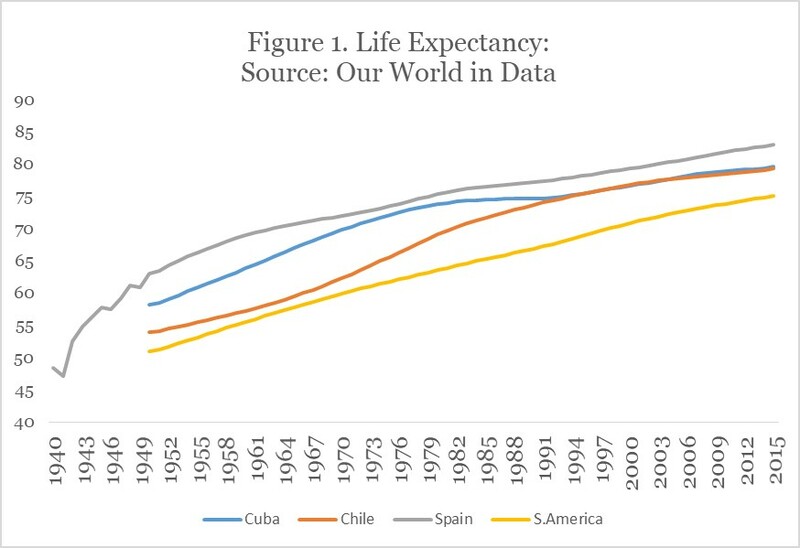 Between 1950 and 1970, a period that includes Batista’s dictatorship (1952-59) and Castro’s first decade, Cuban life expectancy was rising rapidly. But then the indicator stagnates, registering no further progress until the 1990s. As for Chile, whereas in the 1950s and 1960s life expectancy there was barely above the South American average, under Pinochet it took off, leaving the continent behind. On literacy, Table 1 shows there is no difference in rates among the three countries. The quality of the reading material, however, is another matter. Even as it was censored, under both Franco and Pinochet publications independent of the regime survived and grew increasingly assertive as the dictatorship loosened its grip. The same was true of educational or cultural institutions and think tanks. But this was not the case in Cuba, where the Communist Party and affiliated organizations monopolize publication, producing material, including that aimed at an academic audience, that is dull at best and propagandistic at worst (Grenier 2016). (An exception to the monopoly was made after Pope John Paul II’s first visit to the island, when the Catholic Church began to publish pastoral material.) This contrasts to pre-Castro Cuba, when “the Cuban people were among the most informed in the world, living in an uncharacteristically large media market for such a small country. Cubans had a choice of 58 daily newspapers during the late 1950s, according to the UN statistical yearbook. Despite its small size, this placed Cuba behind only Brazil, Argentina, and Mexico in the region. . . .” (International Book Publishing, Inc., 2015, p. 248). Finally, I take up democide and transition. As Table 1 shows, Franco and Castro were directly or indirectly responsible for the deaths of a comparable proportion of their subjects, while Pinochet’s death toll was only one-tenth that of Cuba or Spain, and the annual rate about one-fourth as high. Regarding transition, whereas the dictatorship dissolved in Spain after Franco’s death and in Chile after Pinochet lost a referendum, in Cuba it was transferred from one brother to the next, and as of the time of this writing it appears as if another succession is in the works, possibly in the form of a de facto hand-off to a younger member of the Castro clan, something not seen in Latin America since the time of the Somozas of Nicaragua. Summing up, the data presented here demonstrates that all three dictatorships repressed their populations, but they differed in lethality, economic growth, life expectancy, literacy, and transition. Economically Franco’s regime was by far the most successful and Castro’s the least. Pinochet’s dictatorship made the greatest relative progress in extending human life. On literacy, the regimes are comparable in terms of rates, but the quality of the reading material was much higher under Franco and Pinochet than under the Castros. As for democide, Franco and Castro were far more deadly than Pinochet. Lastly, in both Spain and Chile the dictatorship dissolved in a more or less speedy transition to democracy while in Cuba the autocracy survived the disability and death of its founder. Fidel Castro’s rule lasted longer than that of any dictatorship in Latin American history, and he succeeded in keeping it in the family after his retirement and death. That, and not any improvement in the welfare of the Cuban people, was his singular achievement. Alfred G. Cuzán is a distinguished university professor of political science at The University of West Florida. Two of his earlier works on Castro and Cuba are included in the bibliography. Altbach, P. G. and E. S. Hoshino (Eds.). 1996. International Book Publishing: An Encyclopedia. Routledge. Astorga, P., A. R. Bergés and V. Fitzgerald. 2005. “The Standard of Living in Latin America over the Twentieth Century,” Economic History Review, 58, 4: 765-796. Cuzán, A. G. 1999. Fidel Castro. A Machiavellian Prince? A shorter version is available at Cuba in Transition, Vol. 9. _____. 2012. “Totalitarianism in the Tropics. Cuba’s ‘Padilla Case’ Revisited.” Cuban Affairs, 7, 3. Grenier, Yvon. 2016. “Temas and Anathemas: Depoliticization and ‘Newspeak’ in Cuba’s Social Sciences and Humanities.” Revista Mexicana de Análisis Político y Administración Pública, 5, 2, 155-181. IBP, Inc. 2015. Cuba Information Strategy, Internet and E-Commerce Development Handbook. Washington: International Business Publications. Rummel, R. J. 1997. Statistics of Democide: Genocide and Mass Murder Since 1900. Table 14.1 D (Spain), Table 15.1A (Chile), Table 15.1B (Cuba). C UNESCO Statistical Yearbook, various years. D U. N. Statistical Yearbook, various years. This source is also cited in Cuba Information Strategy, Internet and E-Commerce Development Handbook – Strategic Information, Programs, Regulations (World Business and Investment Library, 2015). E Altbach and Hoshino (1996, pp. 576, 578). F CIA, World Factbook that year.